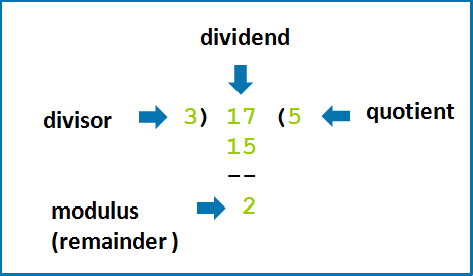 As shown above, when we divide 17 (dividend) with 3 (divisor) then the quotient is 5 and the modulus (or remainder) is 2. The Modulus Operator allows operation for both floating point types as well as integer types. When 32 is divided by 10, the quotient will be 3 and the modulus (or remainder) will be 2. Similarly when 36.75 is divided by 10, the quotient will again be 3, where as the modulus will be 6.75.